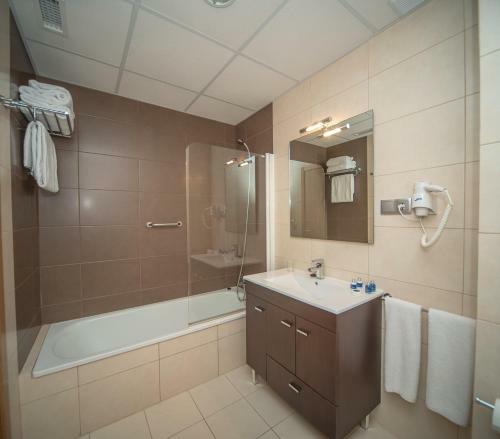 The apartment was clean, modern, huge for one person, well appointed with tub/shower, bidet, kitchen appliances, dining table, good WiFi, and a nice view. I was able to do laundry with wash & dry in a locked room. Elevator for hauling luggage but stairs were also convenient. Breakfast buffet had many choices. I ended up adding a night to my reservation to enjoy it longer. Definitely the place to stay in Jaca. I did not eat at the restaurant so I cannot comment on it. Big new renovated rooms. We are slightly higher up so nice view of the town and valley. Great place with nice food, although if you wanted something special you need to drive into old town. Staff were englishfluent and very helpful. We used it as a base to visit the mountains. Very friendly reception staff. Nice bright property with good access. We enjoyed a good dinner in the hotel restaurant, very quick, friendly service and good food. The staff at reception were very helpful. I was very happy there were blankets on the bed, not an overweight duvet. Lovely hotel very clean, lovely staff very helpful and restaurant brilliant staff in there very helpful food great.always stay here on our way back and to Spain. Stayed here before. It’s lovely and clean, really good hotel. Used as stop over several times, good for late check in and early starts. Restaurant always good with friendly service. Worth doing the extra few miles to get out of France and have a better quality hotel at lower price. 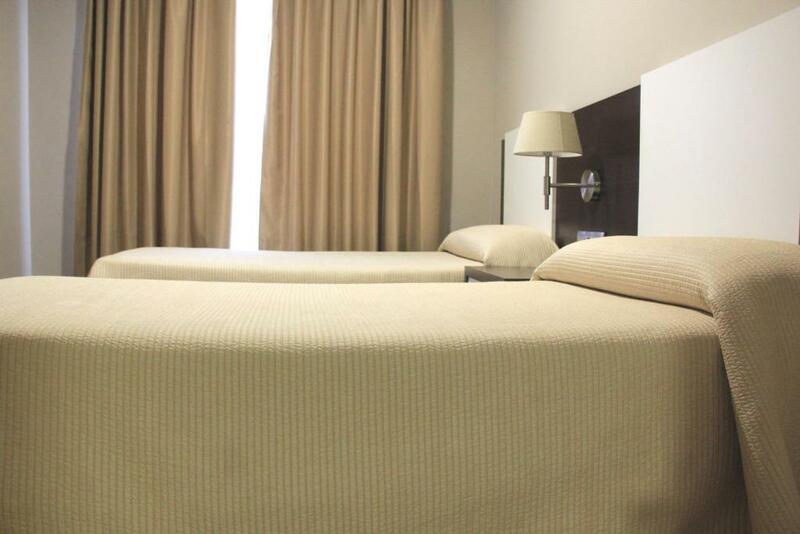 Clean and spacious,it was our first time at this hotel, and were not disappointed. Lovely kitchenette, with all essential utensils with one exception - a kettle! fortunately we had our own so was not a problem ! would certainly return as is very convenient for the Carrefour supermarket , fuel station, and the through route from Spain to France via the Somport tunnel. The staff at the reception was very usefull. We were recommended excellent hiling trails nearby. The kitchen is very well stocked. Lock in a great price for Apartahotel & Spa Jacetania – rated 8.6 by recent guests! Apartahotel & Spa Jacetania This rating is a reflection of how the property compares to the industry standard when it comes to price, facilities and services available. It's based on a self-evaluation by the property. Use this rating to help choose your stay! Each apartment has functional décor and includes air conditioning and heating. All apartments have a living-dining room, a private bathroom with a hairdryer and a kitchenette with a ceramic hob, microwave and fridge. The Jacetania Apartahotel & Spa has a bar-restaurant with an outdoor seating area. There is also a 24-hour reception desk, ski storage facilities and on-site parking. 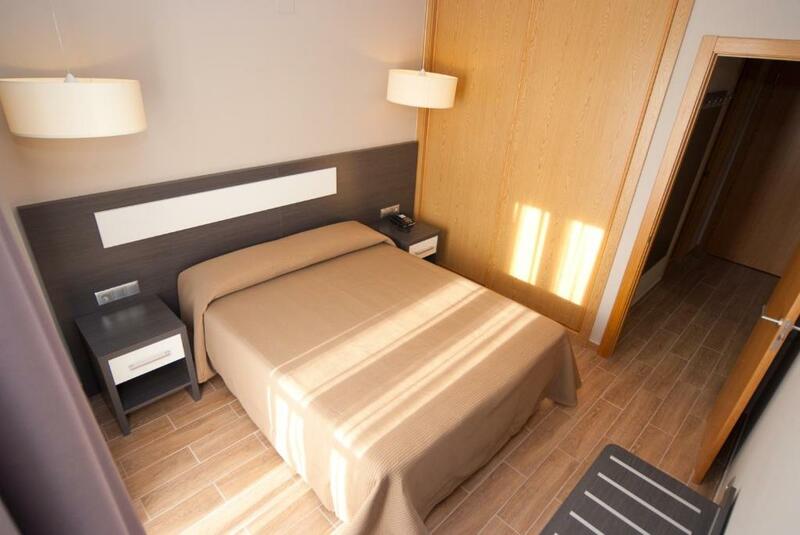 The aparthotel is located in a quiet area, just a 15-minute walk from the center of Jaca. Astún Ski Resort, the French border and the Pyrénées National Park are all less than 19 mi away. Jaca Train Station is 2,800 feet from the apartments. 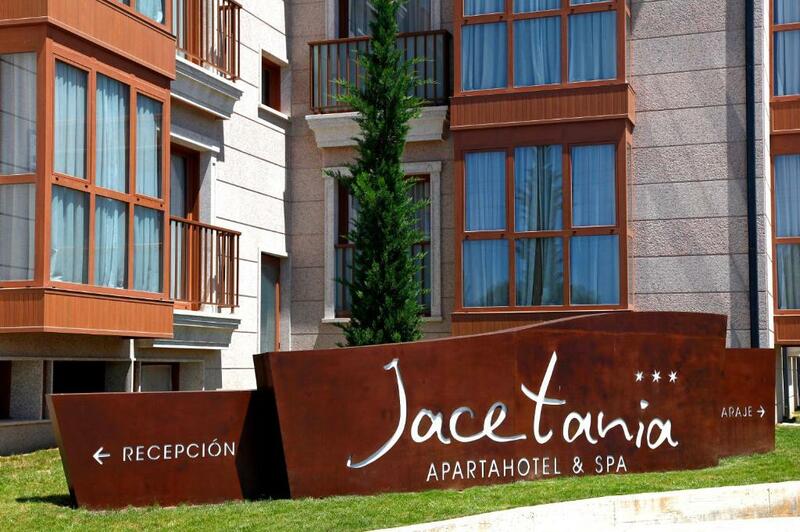 When would you like to stay at Apartahotel & Spa Jacetania? This modern apartment has functional décor and includes free Wi-Fi, air conditioning and heating. 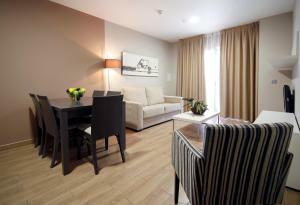 It has 1 double or twin bedroom, a private bathroom with a hairdryer and a living-dining room with a double sofa bed. The kitchenette includes a ceramic hob, microwave and fridge. This modern apartment has functional décor and includes free Wi-Fi, air conditioning and heating. It has 1 double bedroom, 1 twin bedroom, a private bathroom with a hairdryer and a living-dining room with a double sofa bed. The kitchenette includes a ceramic hob, microwave and fridge. This apartment has free access to the Spa. Please note that children older than 13 years old will be considered adults. 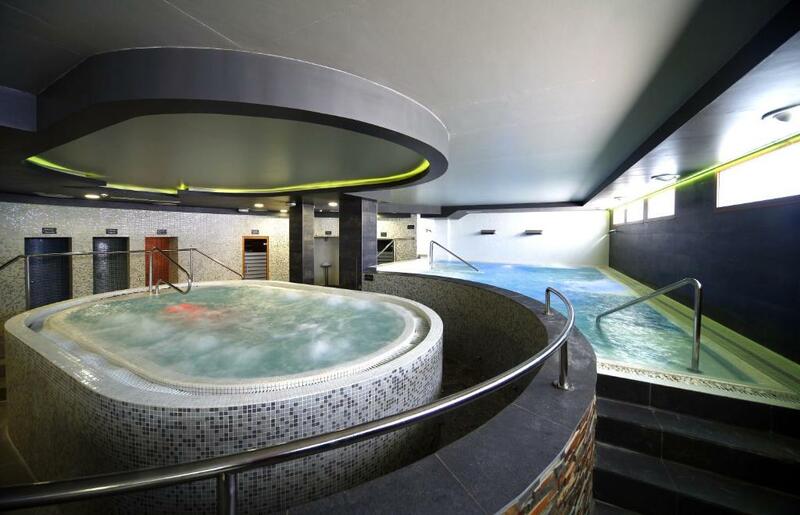 Aparthotel & SPA Jacetania,located in Jaca, surrounded by the Pyrenees, You will enjoy an attractive area full of spectacular and rich historical and cultural heritage natural sites. House Rules Apartahotel & Spa Jacetania takes special requests – add in the next step! Apartahotel &amp; Spa Jacetania accepts these cards and reserves the right to temporarily hold an amount prior to arrival. Apartahotel & Spa Jacetania accepts these cards and reserves the right to temporarily hold an amount prior to arrival. Sunday: 09:30 - 10:30; 17:00 - 18:00. Please note that the spa is closed on Mondays. Spa sessions need to be booked in advance. Please note that the reservation of accommodations does not include access to the spa, unless otherwise specified in the room description. Please note, a swimming suit, flip-flops and a cap are required to enter the spa. Please note that cleaning fees are not included. A daily cleaning service can be requested from reception and carries a surcharge of EUR 10 per day (kitchen not included). Please note that smoking is forbidden throughout the hotel. Note that the outdoor swimming pool is only open during Summer. Please note that the bar-restaurant remains closed on Tuesdays after 12:00. Breakfast is served normally on Tuesdays. We (being Scottish) like porridge or sugar free muesli for breakfast. The breakfast cereals didn't look very healthy, but there was lots of fresh fruit. Hard to complain about anything really but it would have been nice to have a kettle and some instant coffee. A kettle would have been nice but possible to boil water in a pan. One surly receptionist made us feel we were bothering her. Restaurant schedule not flexible enough...Rervation required for same day arrival...Not great if you arrive late. A bit further from downtown than we though..not much close by in term of services.+restaurants. A bit bleak aparment with oldfashioned bathroom. Remote location, if needed to restaurant in Jaca. Just basic breakfast with extra cost. Quite spacious room. Garage with extra cost. Swimming pool, suitable for kids. Very well equipped apartment, clean and comfortable. Very convenient for Jaca, and easy to find.